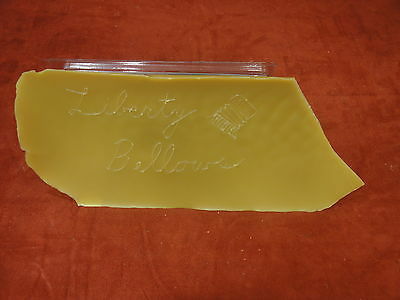 Up for sale is all natural accordion wax made from a blend of Pure High Grade Beeswax and Pine Rosin. To rewax a reed you can melt it down and use a wax flute to pour it or simply cut strips and melt them with a soldering iron. It's best to leave this to a professional repairperson but this is for those do it yourself repairers out there. Comes in various flat shapes and size by weight. Sold by weight. You will get 1 oz / 28 grams of accordion wax per unit which is generally enough to repair 1 reed block. We offer combined shipping and ship internationally. Be very careful when doing your own repairs. This item is sold as is with no warranties and all repairs are at your own risk!